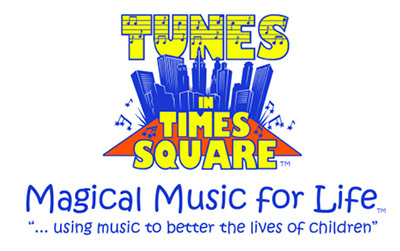 Magical Music for Life Foundation is thrilled to present its third annual TUNES IN TIMES SQUARE benefit concert Sunday, May 4, 2014 at 10:00 a.m. – 6:00 p.m. on the Broadway Pedestrian Plaza between 42nd & 43rd Streets in Times Square. This is a high energy entertaining event, where people walk by and end up staying for hours. The goal of the concert is to raise awareness and funds for the production of free, downloadable original songs written specifically for children with special needs & autism and to continue the outreach efforts of Magical Music. The event will be a continuous sing-a-thon, where preselected, talented children and groups from the tri-state area will join the Magical Music singing groups taking turns singing from 10:00 a.m. – 6:00 p.m. raising money from pledges and donations. There will be performances by various Broadway adult and child actors, as well as a special dance performance by some of the cast of Broadway’s “FELA!” with NCDA. Several children from the special needs community will have the thrilling opportunity to share the microphone as well. There will be many exciting items to bid on & win in the online & silent auction and raffle, including tickets for Broadway and other NYC shows and events with backstage tours, travel, autographed items, travel, dining, unique items, etc. Donations will be gladly accepted at the event or www.magicalmusic.org. Magical Music has produced two original family musicals (The Adventures of Zak and Russell, the Hermit Crab), which have been performed throughout the northeast, written songs for several national well-known charities and children with special needs, and performed at such prestigious venues as the White House Easter Egg Roll, The United Nations for the first World Autism Awareness Day, Citi Field Stadium, the Tribeca Film Festival, and Times Square. This year’s Tunes in Times Square will be Magical Music’s fourth benefit concert involving the participation of hundreds of children. Besides last year’s Tunes in Times Square concert, Magical Music for LifeTM produced One Town … One Voice concerts in 2005 to benefit Habitat Humanity’s Katrina Relief Fund and in 2009 to benefit the national charity, Stand Up to Cancer.